After a busy morning and a working lunch preparing a presentation to the General Synod of the Church of Ireland in Limerick later this week, I went for a walk along the banks of the River Deel this afternoon. Facing the entrance to the site of the former Franciscan Abbey, the derelict buildings of the Abbey Mills form an interesting feature on the east bank of the river, where they had a strategic and commercially advantageous location on the Quay. The River Deel is navigable as far as the weir below the castle and the bridge, and the mill was built here in 1796, beside the abbey ruins that gave the mill its name. This old mill is a detached, rectangular-plan, 10-bay, four-storey corn mill, with a multiple-bay single-storey extension and lean-to at the north elevation. The three-bay, four-storey block to the east has a single-storey lean-to at the north elevation and a taller projecting end-bay to the south elevation. There is a hipped slate roof. The mill has tooled coursed limestone walls. The square-headed window openings have brick block-and-start surrounds with the remains of some timber sliding-sash and cast-iron windows. The window openings to the west elevation are now blocked up, and most of the remaining glass has been shattered. The square-headed opening to the lean-to has double-leaf timber battened sliding doors. There is a hipped slate roof to the east block and the projecting end bay. The coursed rubble limestone walls have tooled limestone quoins. The square-headed window openings have brick block-and-start surrounds and show the remains of bipartite windows. There is a square-headed opening to the east elevation, with a timber battened door. The square-headed opening to the projecting end bay at its north elevation has timber louvered vents. There is a mill race to the west with a round-headed arch that has limestone voussoirs and a keystone. There are rubble limestone boundary walls to the east and the north. The mill was built in 1796, and by the 1830s it was run by the Russells, a merchant family from Limerick. By the 1840s, it brought employment and new prosperity to Askeaton in the 19th century. The Condensed Milk Company of Ireland bought the mill in 1909, and it was used as a creamery from 1927 until it closed in recent decades. The former mill is now derelict, but it remains a picturesque feature when it is viewed from the Askeaton Pool and Leisure Centre on the opposite bank of the River Deel. It is a reminder of the industrial heritage of Askeaton. Although no longer in disuse, the building largely retains its original form and features, including brick surrounds, timber battened door and slate roofs. South of the former Abbey Mill and on a height on the east bank of the River Deel, the former Tall Trees Nursing Home was built around 1810. As the miller’s house, this was an original part of the mill complex. This detached, three-bay, two-storey, former miller’s house has a portico to the front on the south side, and a recent multiple-bay, single-storey extension to the south and a four-bay two-storey extension to the west. There is skirt slate roof with rendered chimneystacks, and rendered walls. The square-headed openings to the front elevation have six-over-six pane timber sliding sash windows and painted stone sills. Those to the west elevation have replacement uPVC windows. The portico has Doric-style render pilasters supporting a moulded entablature. The square-headed opening has a timber panelled door. There is pair of square-profile metal piers with ball finials and a single-leaf metal gate to east and rubble limestone boundary walls that have cut limestone copings. Although the house is now vacant and has been on the market for some years, it retains much of its original form and character outside, despite recent additions and alterations. It remains a prominent feature in the landscape of Askeaton and is enhanced by its good quality boundary walls. Further south along the Quay, there is a former warehouse that was built ca 1847. This is a semi-detached, gable-fronted, three-bay, five-storey former warehouse, and was known as Ryan Mill, and before that as Russell’s Mill. The warehouse has a pitched slate roof, there are rubble limestone walls with roughly dressed limestone quoins, and square-headed window openings with brick voussoirs and timber battened fittings. There is a square-headed loading bay to the centre bay with brick voussoirs and timber battened doors. This warehouse is an integral part of the surrounding group of mill-related buildings in this part of Askeaton. Its deep form is typical of such structures with its gable-ended loading bay facing the quay. Here corn was directly hoisted from the boats on the River Deel. At one time, the Russells proposed dredging and deepening the River Deel at this point, but commercial vessels have not docked at the Quay since 1952. Today, the warehouse still has its original structure, including the external and internal timber fittings, brick dressings and the slate roof. In the 19th century, the Quay at Askeaton was painted by Richard Brydges Beechey (1808-1895) a painter and admiral. 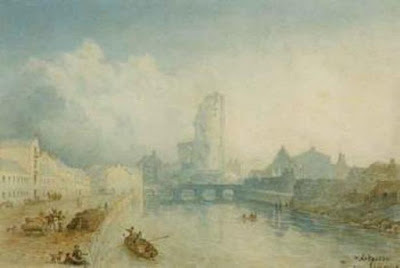 The painting was sold at auction by Whyte’s of Dublin in September 2006. Much the charm of this stretch of the River Deel at Askeaton can still be seen today.